Hope you have a wonderful day! 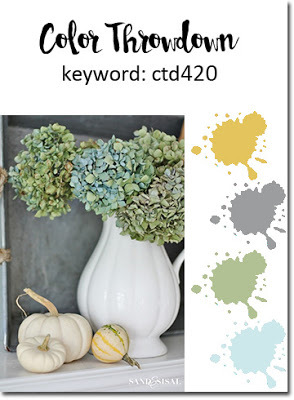 I hope you will hop over to the AJVD blog for a look and to let me know what you think. Hello!! Popping in with a quick post today. 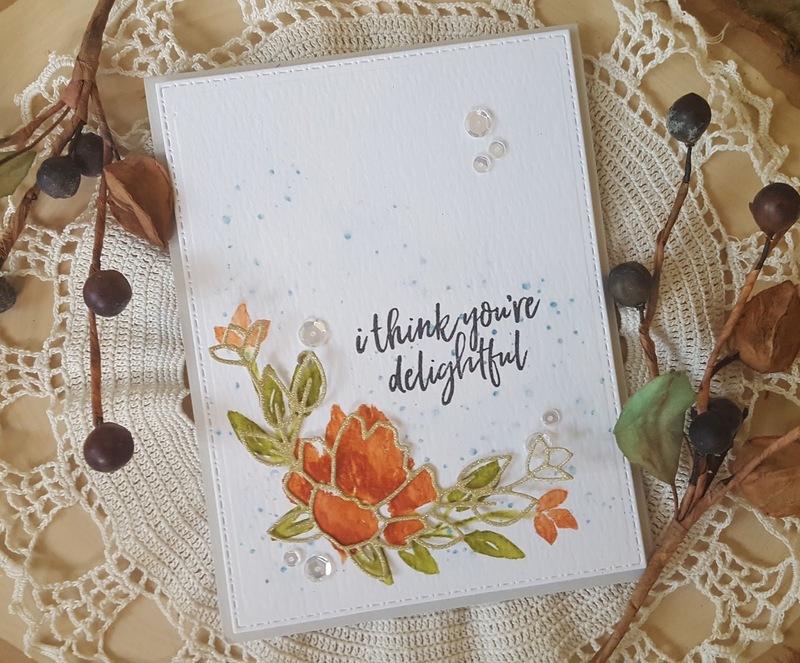 The current Essentials with Ellen Pin-Sights challenge is closing soon and I finally got my card made and ready to go! Took me awhile to figure out what I was going to do, but I finally settled on using the Mondo Hydrangea and Lovely stamp sets. 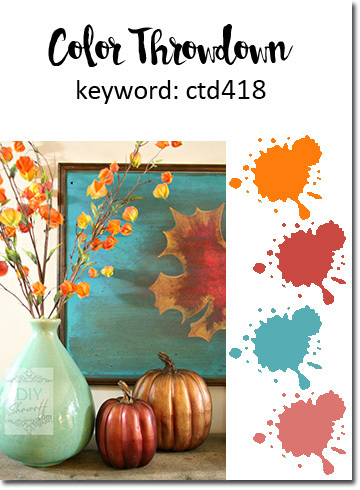 This month's pin-sights mood board is full of fall loveliness and I decided to focus on the pumpkins and gourds in the photo. 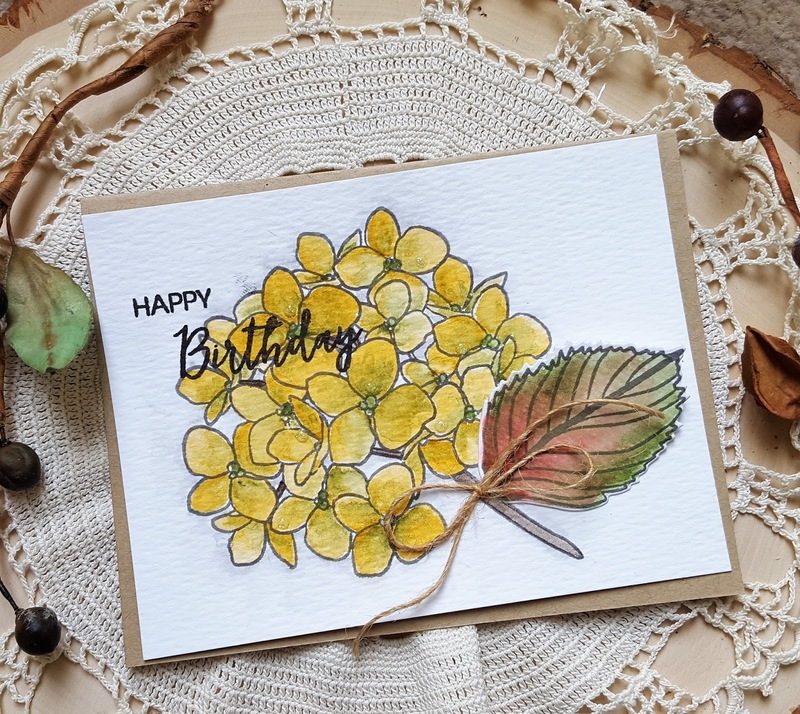 I colored the hydrangea using my Kuretake Gansai Tambi watercolors starting with light brown (which actually looks yellow to me!) and then adding in some olive green. I was trying to get the look that hydrangeas take on when they are done blooming and the flowers are starting to fade. The leaf was colored with the olive green and then I added in some red. Once the leaf was dry I die cut it with the matching die. The stem was colored with a dark brown. Once the main panel was dry I trimmed it down and stamped the sentiment. 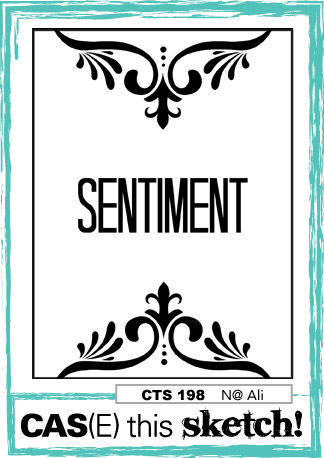 I used my mini MISTI to stamp the sentiment multiple times to get a nice dark impression. A small slit was made in the stem and the leaf was inserted. I finished things off with a little twine bow and added some Nuvo Glitter Drops in White Blizzard. This is my first time using them and while you can't really see then in the photo I really like how they look. Hello!! Well... the holiday weekend is coming to a close and I finally found a little bit of time to make something albeit not my best effort, but that is how it goes sometimes, right? 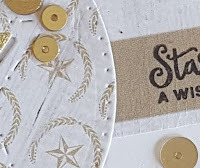 I really wanted to make something for Color Throwdown and I had also been wanting to use the wheat dies from Reverse Confetti so I put the two together. When I originally started this card I was going to use a different sketch, but when I saw the one from Paper Players thought I would use it instead. I die cut the outline wheat image from a light blue, sage green and amber yellow cardstock three times each and then used spray adhesive to adhere them together. 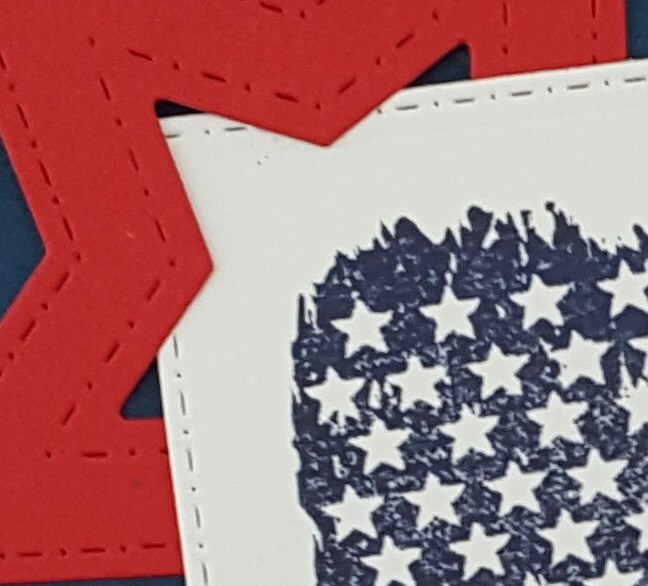 I love using spray adhesive for delicate die cuts. The only thing I don't like is that I have to go out to our garage in order to use the stuff... fumes and all. Then I added a wash of gray to some watercolor cardstock using a gray ZIG. Once that was dry I die cut it and then adhered the wheat die cuts. The banner was die cut from white and the amber color cardstock using the banner from the RC Tag Me die set. 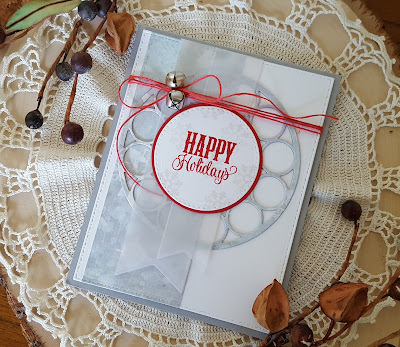 The sentiment (from the RC set Class Act) was stamped and then die cut using the circle die from the RC Fresh 'n Fruity die set. The main panel was matted with some additional sage green cardstock and then everything was adhered to a light blue cardstock base. Is anyone else a little frustrated with the changes that Google made to Blogger? I don't know why they had to change something that worked just fine, but they did!! 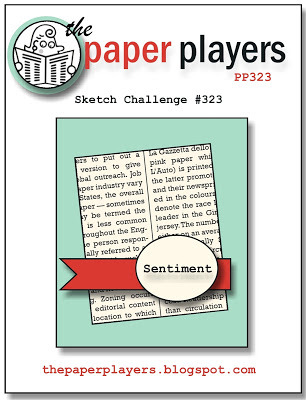 Going to add this to the current Simon Says Stamp Monday challenge of trio-tastic. Hello!! Hope everyone here in the US had a lovely Thanksgiving! We had a really wet one, but that is the Pacific Northwest in the winter! 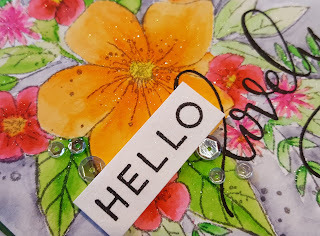 Stopping in with my card for this month's PTI blog hop. 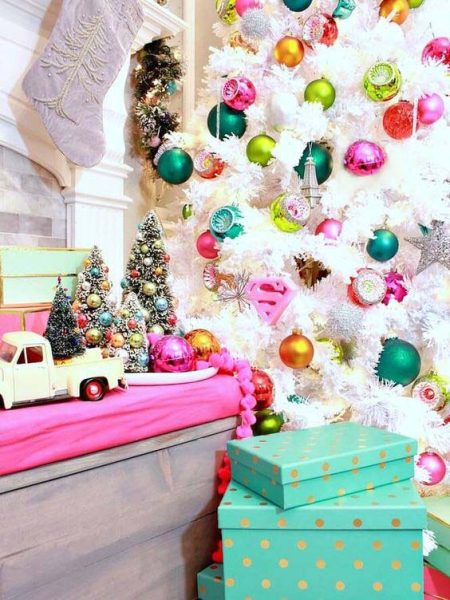 Nichole provided a lovely inspiration photo with lots of different directions you could go in. I decided to focus on the two packages that were done in blue with gold polka dots. It made me think of Tiffany Blue so the hunt was on to find a light robin's egg blue in my collection. I finally hit on one with some very old Close to My Heart cardstock that I have. 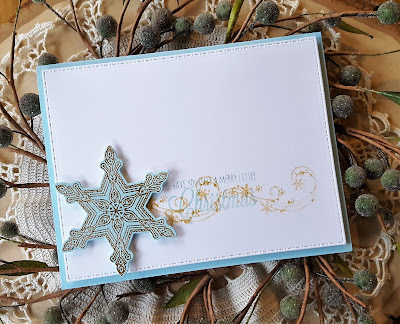 I used PTI's What the Doodle: Snowflake, as well as a sentiment from Rustic Wreath. I stamped the large snowflake on the light blue cardstock using VersaMark ink, applied gold embossing powder and heat set. Once I had that done I die cut the snowflake using the matching die. The swirl image from the set was stamped twice using Delicata Golden Glitz on a panel of white cardstock that I die cut and then the sentiment was stamped using a light blue similar to the cardstock. The sentiment is hard to read, but I didn't want to use a really dark ink like black so I went with the light blue. 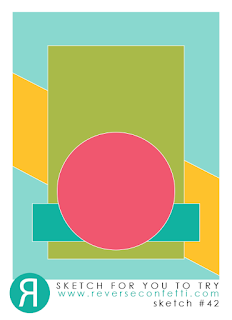 The layout for the card is based on the current Freshly Made Sketches so I will be posting it there, as well. 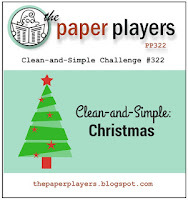 Also posting this to the current SSS Wednesday challenge of Christmas to die for. 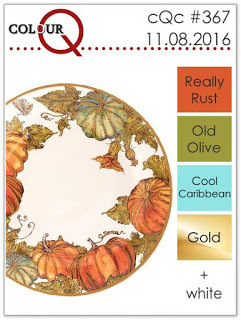 Hope you have a wonderful day and a wonderful Thanksgiving... hope you will take some time to head over to the AJVD blog for a look and to let me know what you think. Hello!!! The weekend is over and here in the US Thanksgiving is just a few days away. My youngest is so excited that he only has two days of school and my oldest is happy because he gets is birthday off (Wednesday the 23rd... can't believe he is 18!!)!! 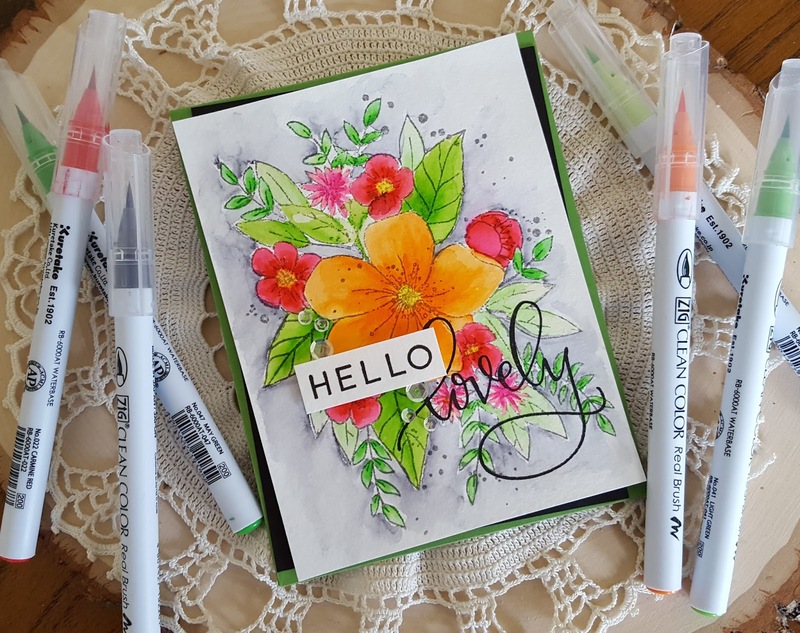 Found some time this weekend to do some coloring with the newly released Hello Lovely stamp set from Concord & 9th. When I saw that set I absolutely had to have it!! The large floral image is stunning! I had only planned on practicing my watercoloring with the image so I stamped in on some inexpensive watercolor paper. My stamping wasn't that great because I thought was just practicing! But as I got more and more into the coloring I was liking what I saw and so when I was done I turned it into a finished card. 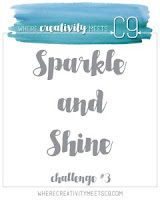 I'm going to add this to the current Where Creativity Meets C9 challenge of sparkle and shine, as well as the current Flower challenge (occasions... I'm planning on using this as a birthday card for my younger sister). I colored the image using my ZIGs (orange, 3 shades of green, red and pink) and clean water. Once the image was fully colored I used a gray ZIG to add shadowing around the image. Clear Wink of Stella was added to the image, as well. 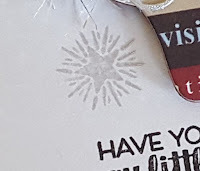 I then stamped the sentiment using my mini MISTI and VersaFine Onyx Black ink. The hello was stamped on the same watercolor paper, trimmed down and then covered with more Wink of Stella. I trimmed down the panel, adhered the hello with foam dimensionals and then added some Pretty Pink Posh sparkling clear sequins. Layered the panel with some black cardstock on a green cardstock base and I was done. I have included a close up photo so you can see the sparkle from the Wink of Stella. 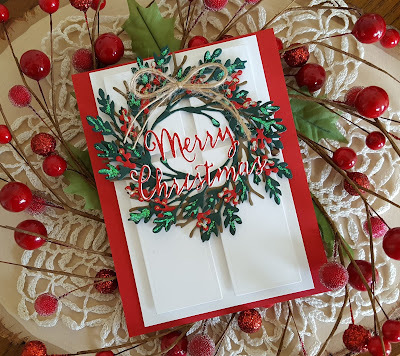 Hello... stopping in with a simple card for a couple of challenges: Merry Monday Christmas challenge (used red, grey and white) and November Viva La Verve sketch #1. 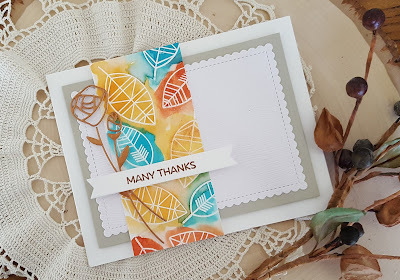 I have been wanting to play along with the Viva La Verve sketches for ages and to use my long neglected Verve stamps and the Merry Monday challenge gave me the opportunity. 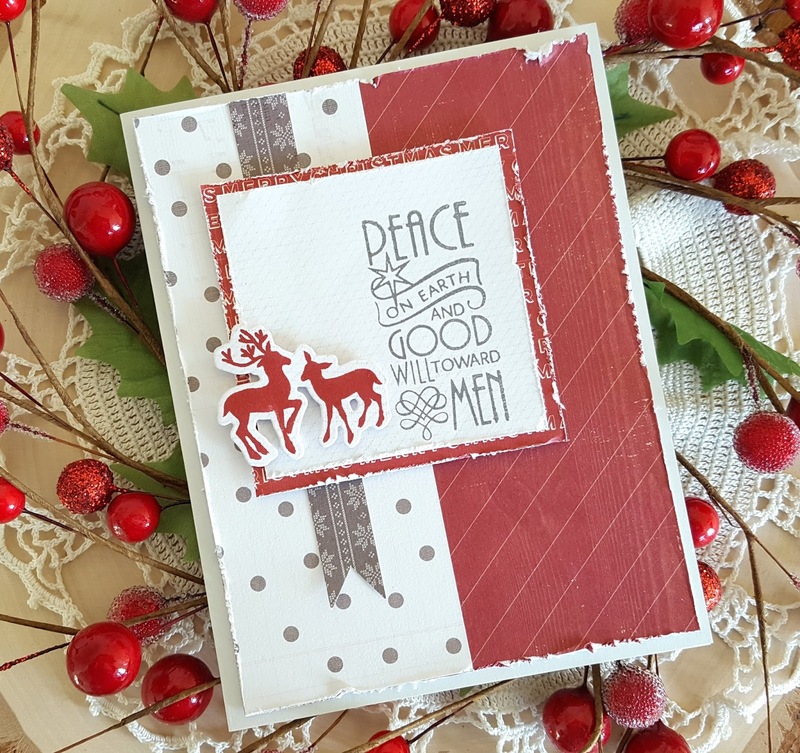 I used two Verve sets: Unto Us and Peace on Earth and one of the dies that matches the Unto Us stamp set. I used some papers from the Pink Paislee Yuletide pad... just trying to put a little dent in my huge stash of 6x6 pads, lol!! 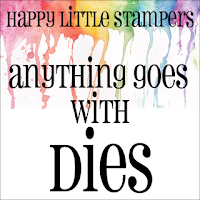 The inks are Stampin Up! Cherry Cobbler and VersaFine Smoky Gray. After cutting all the pieces of patterned paper I roughed up the edges a bit. I decided to go a bit old school and I did not use much die cutting except for the reindeer. I even hand cut the fishtail banner! 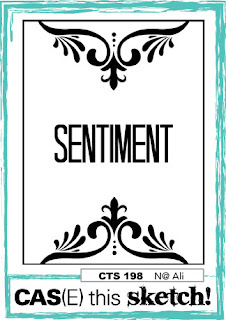 Stamped the sentiment, layered everything up on a light grey cardstock base. 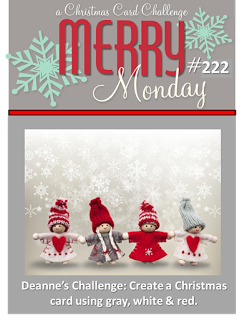 I'm also going to add this to the current Simon Says Stamp Monday challenge of Christmas critters since my card has reindeer on it. Hope you have a wonderful day... would love it if you would take the time to head over to the AJVD blog and let me know what you think... comments are always appreciated! Hello!! Our wet and rainy weekend is coming to a close and it will turn into a rainy week! Found some time this morning to make a card for a couple of challenges... ColourQ and Where Creativity Meets C9 - Sparkle and Shine. 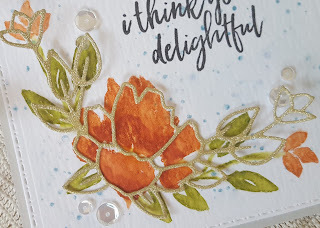 I pulled out my C9 Brushed Blossom stamps and the coordinating die and did a little watercoloring. I stamped the images on watercolor cardstock and then blended the colors out with a little bit of water. To get more depth to the color of the flower I used my MISTI to add more of the rust color and then blended it out a bit. Once that was finished I added the sentiment and then stamped the two little splatter images from the set using a light blue color. The splatters were blended out slightly with more water. Once the panel was dry I die cut it with an AJVD Stitched Dot rectangle and adhered it to a light gray cardstock base. The CT floral die was cut from gold glitter cardstock and adhered to the image. For some additional sparkle I added some Pretty Pink Posh sparkling clear sequins in two sizes. I think I over did it a bit with the little splatter images, but live and learn... right? I have included a close up of the floral image with the gold glitter die cut so you can see more of the sparkle... it looks so pretty in real life! Hello!! Well... I have something fun to share! 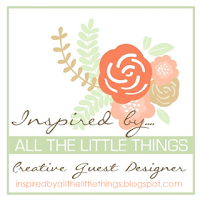 Today I am guesting at Inspired by All the Little Things!! Last month I was contacted by the super talented Karren about guesting with her for today's challenge. 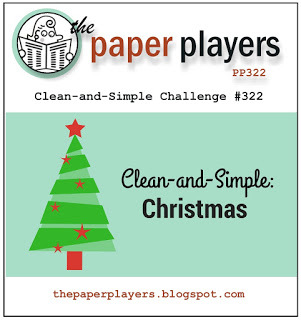 I was so excited that she contacted me about being a part of this fun challenge that I said "yes" immediately. Karren is a super talented colorist and paper crafter. If you want to be inspired you must check out her blog! 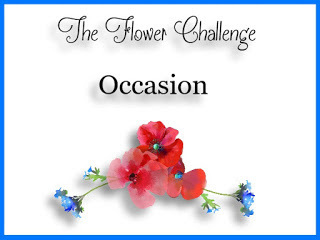 You can find out all the details about participating in the challenge here. This week's inspiration is a fun photo of a set of old fashioned skis with a wreath (see photo below). 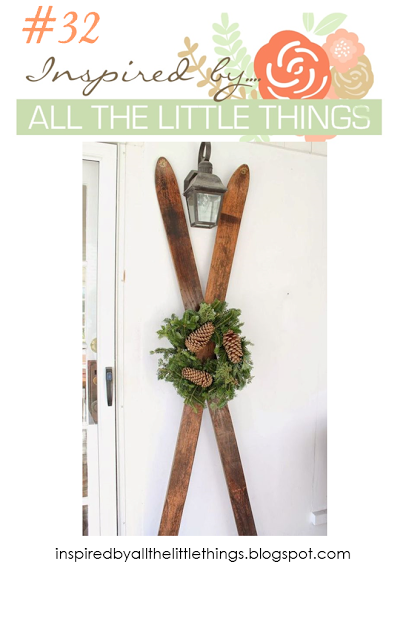 When I saw the inspiration photo I immediately thought of making something with skis, but unfortunately I don't own any stamps with a set of skis in them so I had to go a different route. 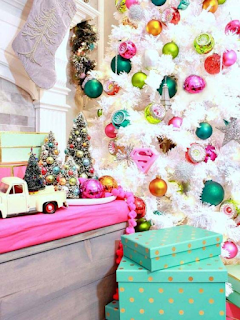 I decided to focus on the wreath in the photo, as well as the colors. Since the colors are rather muted I looked through my stash of patterned papers and settled on some papers from the Pink Paislee Yuletide 6x6 pad. My layout is based on this month's Reverse Confetti Sketch for You to Try. I die cut the wreath using the RC Leafy Wreath die from the green patterned paper twice and then layered them together slightly offset. 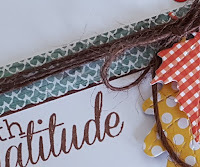 I used the two small sprig dies from the Leafy Wreath set to die cut some brownish patterned paper for my "pinecones" and adhered them to my wreath. 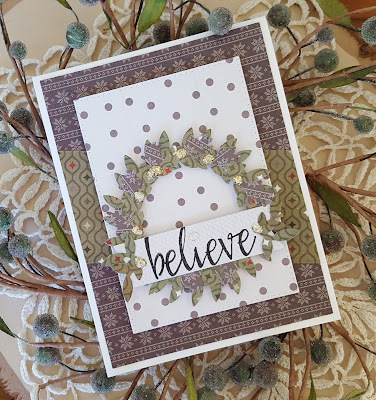 The banner (from the RC die set Tag Me) was also die cut from some paper from the Yuletide pad and then stamped with the word "believe" (from the RC set Walk by Faith) in black ink. The banner was then adhered to the wreath. 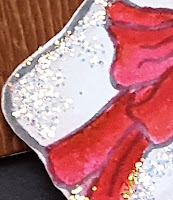 After layering up everything as you see I added some little leaves to the banner and Ice Stickles for a bit a sparkle. 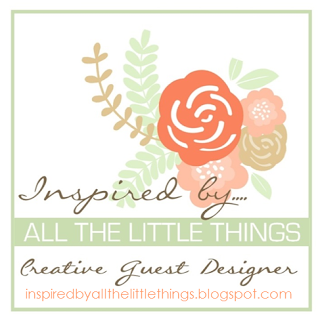 I hope you will check out Inspired by All the Little Things and a big thank you to Karren for asking me to be the guest designer this week!! Hello!!! 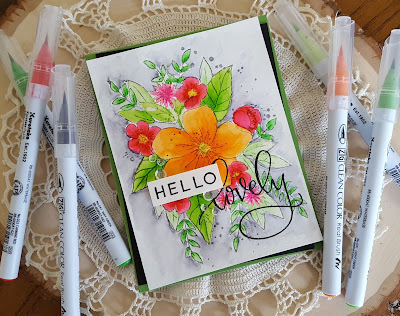 Stopping in with a card that I made for several challenges: MFT Wednesday Sketch challenge, Color Throwdown and Simon Says Stamp Wednesday challenge. I recently got some happy mail in the form of some new items from MFT and because I spent at least $60 I got this month's free die and it is absolutely gorgeous!! I used it on my card today. 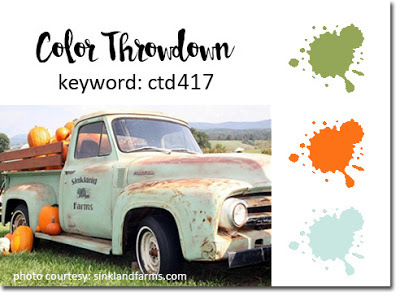 When I saw the new combo over at Color Throwdown I didn't think I would be able to play along because I was pretty certain I had nothing copper in my stash. I soon discovered that I was wrong when I found some beautiful copper cardstock that had come with my September My Monthly Hero kit. YAY!! I die cut the rose, bud and stem from the copper cardstock and then three times from white cardstock. I layered all the die cuts. Because the die cuts are so delicate I used spray adhesive and it worked like a charm. Once that was done I moved onto the rest of the card. My happy mail also contained the beautiful Geometric Greenery stamp set. I stamped two of the leaves from the set on watercolor cardstock with VersaMark, applied white embossing powder and then heat set. Once that was done I used MFT's Tropical Teal, SU! 's Pumpkin Pie and PTI's Terra Cotta Tile to watercolor all the leaves. I die cut a panel of woodgrain cardstock using the MFT Stitched Mini Scallop Rectangle Stax and then a panel of a neutral cardstock using an AJVD rectangle die. 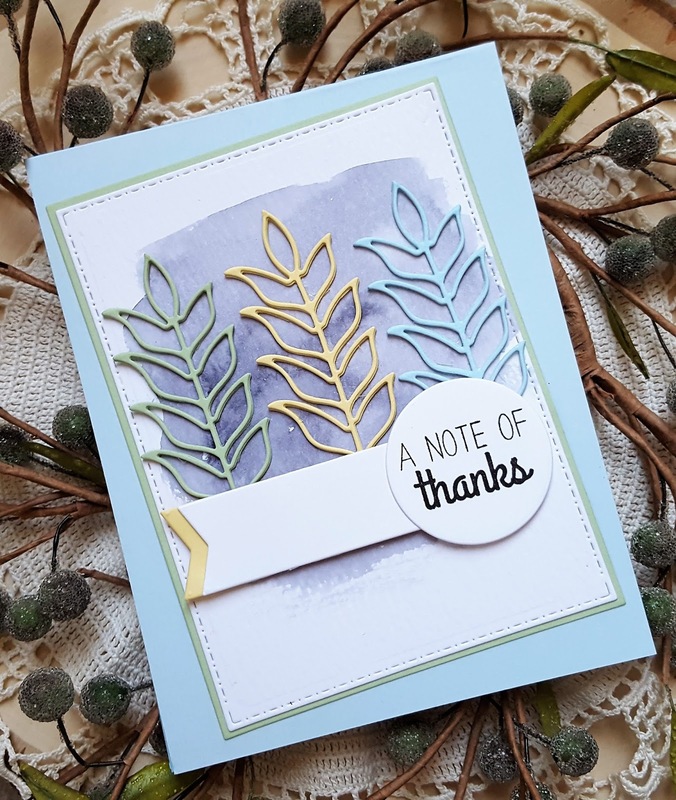 The sentiment (also from Geometric Greenery) was stamped on a banner that was die cut using an MFT Fishtail Flag Stax die that I also used to fishtail the other side of the die. When the watercolor piece had dried I trimmed it down and the layered up all the elements pursuant to the sketch. Initially I was concerned that this might look like a "hot mess", but I think it turned out rather nice. Looking at my photo it does appear that my orange is yellow, but it is orange! Have a wonderful day... I hope you take the time to head over to the AJVD blog for a look and to let me know what you think. Hello!! Wow...we had a ton of rain this weekend!! I have not seen that much rain in a very long time, but I'm glad that we got it because despite Washington state being known as the evergreen state things haven't been so green around here lately!! All that rain meant an opportunity to stay inside and make a few cards. 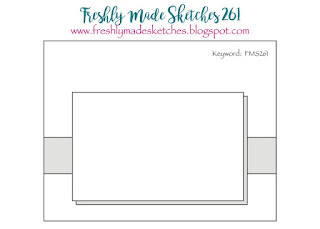 Sharing one today that I made for Freshly Made Sketches, as well as the Hero Arts holiday card challenge. 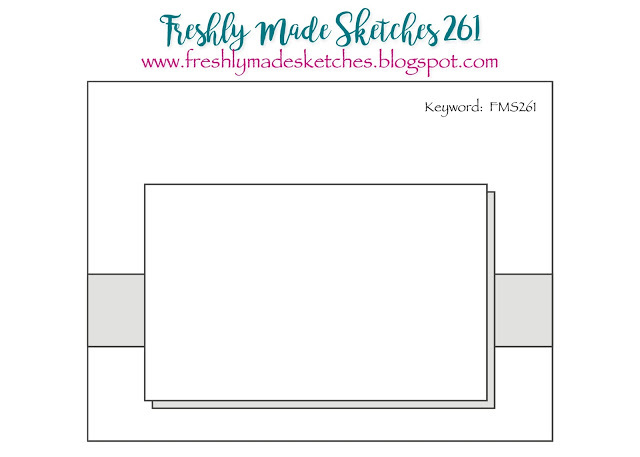 This past Tuesday I was tickled pink to see that my card for the previous FMS layout was picked as the "Queen of Clean"!! That really made my day!! For my card today I used the same stamp set from the October My Monthly Hero kit and did a little more simple watercoloring. I started by stamping the tree line coloring my stamp with a Bundled Sage distress marker and then stamping. Forest Moss was colored on next and then stamped. I lightly blended the colors out with clean water. I did second generation stamping for the rest of the trees using the same colors and then blending out. I added a few of the single trees in the foreground using Forest Moss and Gathered Twig markers and then blending out lightly. The bench was stamped using the same method and a Barn Door distress marker and blending out. I stamped the lamp post in VersaFine Onyx Black because I wanted it to have a more distinct look. The little snowman was lightly colored around the edges with Pumice Stone and Ground Espresso markers and then blended out to give him a little less distinct look. The snowy sky was stamped using Pumice Stone and Broken China markers and then blended out. 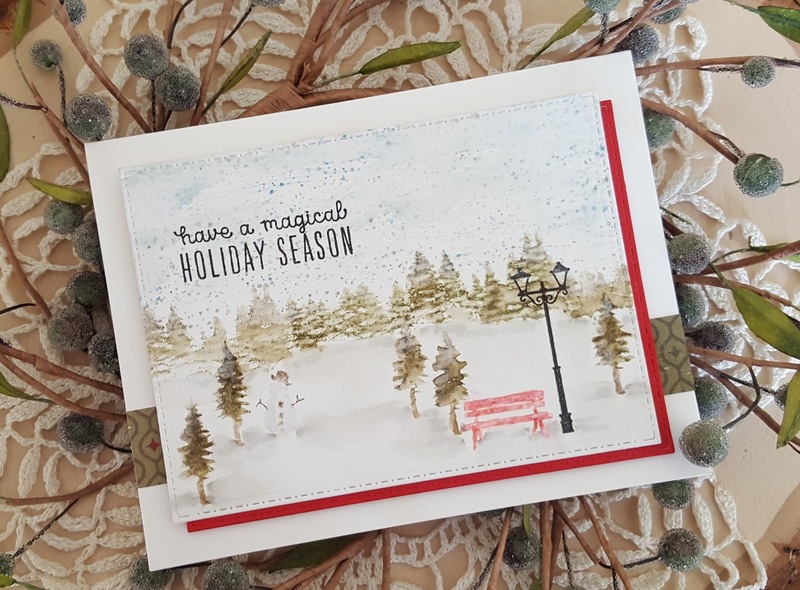 To give a bit of a snowy look I overstamped portions of all the images with Simon Says Stamp white pigment ink. 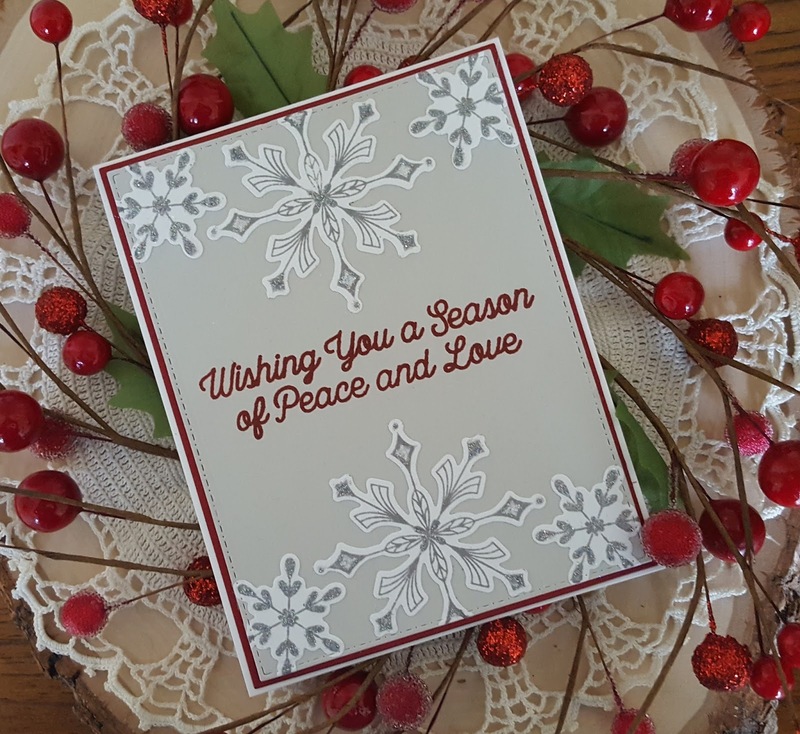 The panel was die cut and then stamped with the sentiment using Onyx Black ink. Finished up with the mat and strip of patterned paper. I really love how this little scene turned out! Hello!!! Well... the weekend is finally here! Had a crazy, busy week which once, again, left me with little to no time to craft... oh well... that is life, lol!! 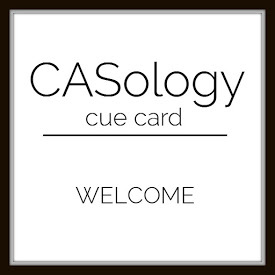 But I did manage get find a little time to make a card for the current CASology challenge (welcome) that uses the color combo from Color Throwdown. 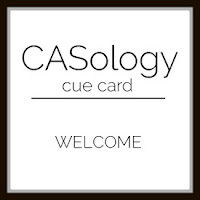 When I saw the CASology cue I immediately thought of my Concord & 9th Pop Art Pineapple set. 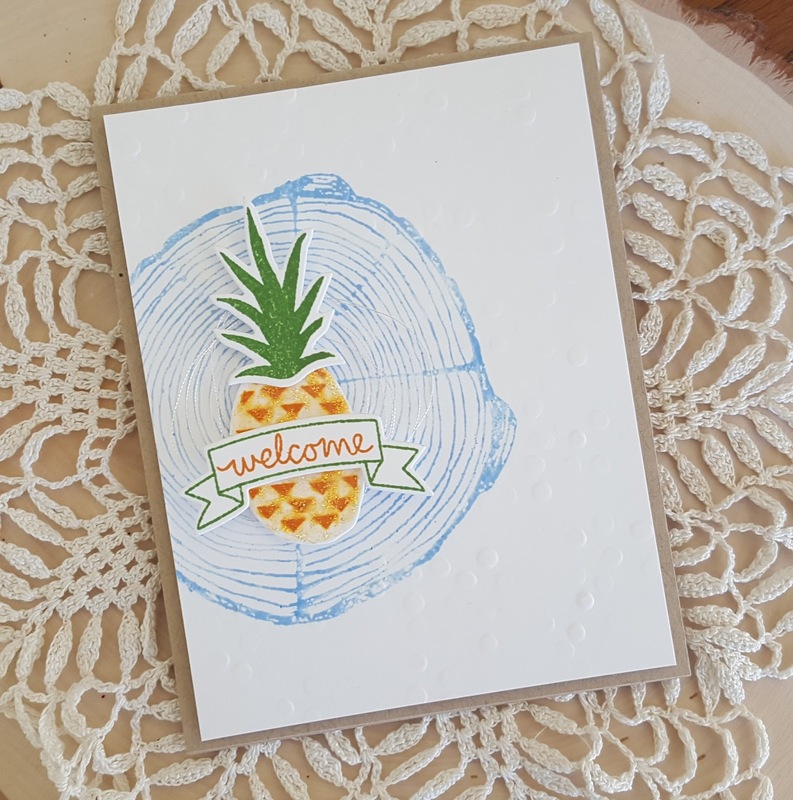 Pineapples are a traditional symbol of hospitality and welcoming people so it was the perfect image for the challenge. I also used Concord & 9th's Tree Ring Background stamp. I stamped the tree ring using a light blue ink (Hero Arts Cornflower) on a white cardstock panel. The panel was then trimmed down. 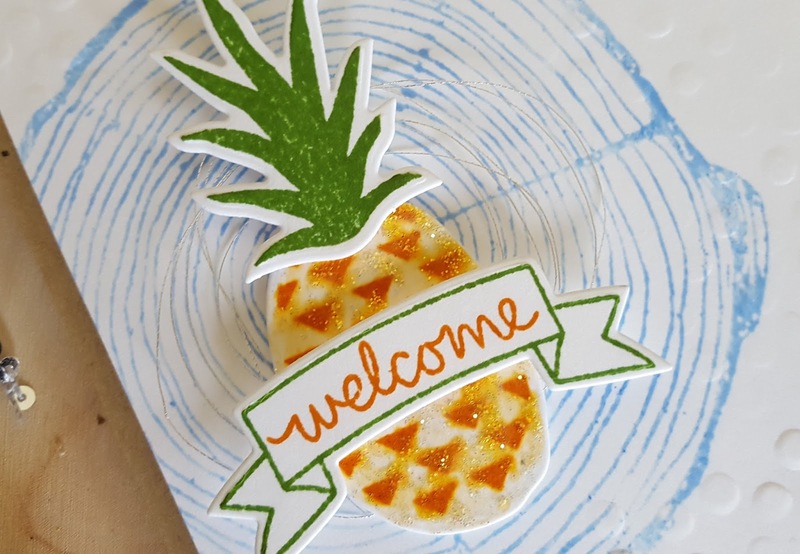 The pineapple was stamped using orange ink (SU! Pumpkin Pie) and the top using a dark green (SU! 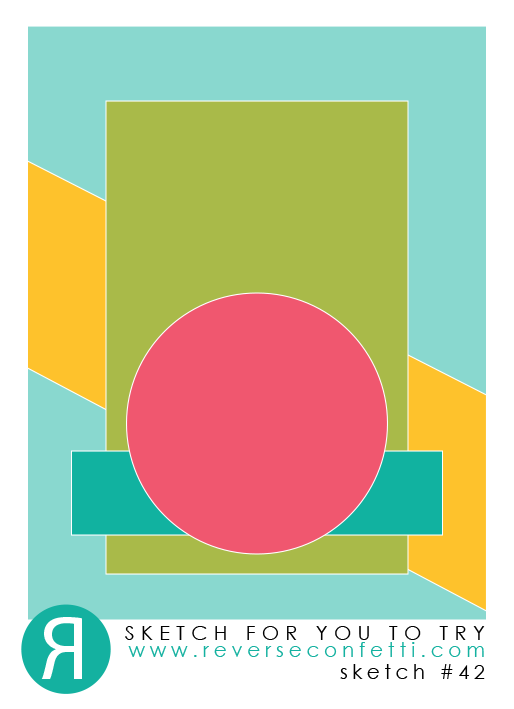 Gumball Green). I brushed some Diamond Stickles onto the pumpkin which smeared the ink a bit, but I like how it looks. 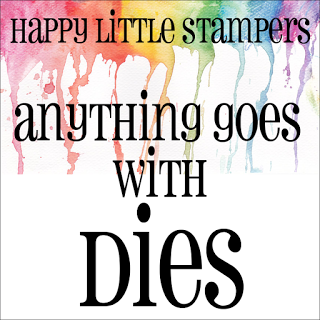 I used the orange and green inks to stamp the banner and sentiment. Everything was then die cut with the matching dies. Once the pineapple was dry I assembled the rest of the card. I added some silver thread behind the pineapple and then partially embossed the panel with my favorite embossing panel (SU! 's Decorative Dots which is now no longer available). I have included a close up of the pineapple so you can see the silver thread. Supplies: Cardstock: PTI kraft, white; Stamps: Concord & 9th; Dies: Concord & 9th; Inks: Hero Arts and Stampin Up! 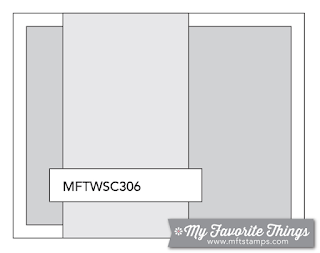 ; Silver thread: Coates & Clark; Embossing folder: Stampin Up! Have a wonderful day and I hope that you will head over to the AJVD blog for a look and to let me know what you think! Hello!! Got some time yesterday to make another Christmas card. 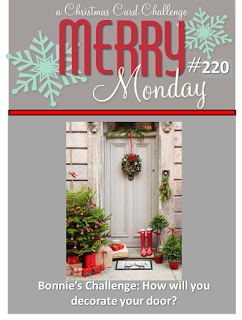 This one is for the current Merry Monday Christmas challenge of how will you decorate your door, as well as the Hero Arts holiday card challenge. I was on a mission to use my September My Monthly Hero card kit and when I saw the Merry Monday challenge I knew the inspiration I needed. I started by created my wreath using one of the wreath dies from the kit as well as a branch die that comes in the kit. I die cut the wreath from a brownish cardstock and the branch from hunter green. I then layered them together. Some little berries were die cut using a die from the add-on Hero Arts stamp and die set called Christmas Trimmings. Once I had the wreath done I got started on my door. I die cut the rectangles using a small Spellbinders rectangle die and a small Spellbinders long rectangle die. The pieces were then adhered to a piece of white cardstock that was trimmed down to create the door. I added a little brushed metal brad for my door knob. I adhered the door to a red cardstock base and then added my wreath. My wreath is kinda oversized for my door, but I have seen doors with oversized wreaths on them! For some sparkle I added some Crystal Stickles to some of the greenery and the little berries. 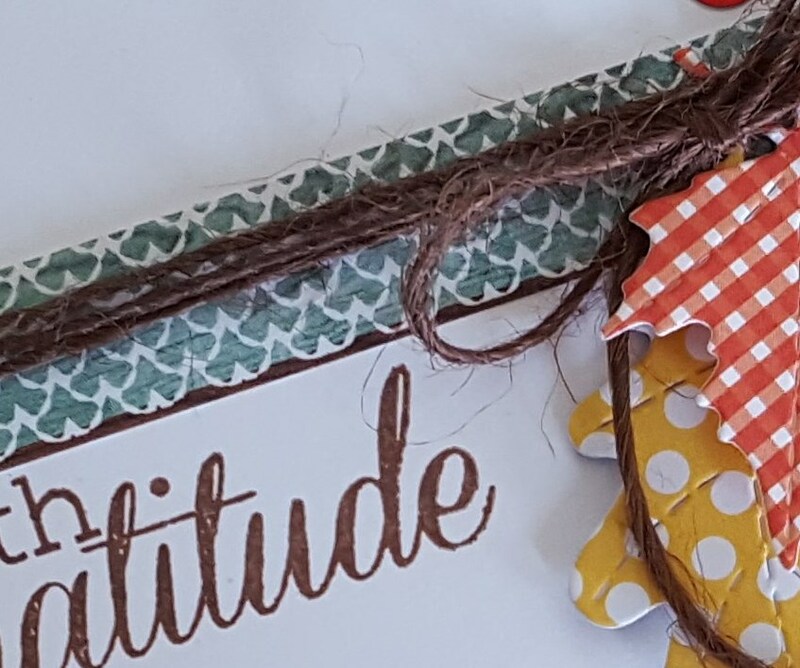 The twine bow was adhered and then finished things off by stamping the sentiment from Christmas Trimmings, die cutting it with the matching dies and adhering it to the wreath. So there you have it... that is how I will decorate this door, lol! !